Jeremy and I had been engaged for a year before we started planning our wedding. We decided to take our time together, and after we bought a home and got settled, it seemed like the right time to start thinking about the wedding. But when it comes to wedding planning, where do you start first? For us, it wasn’t the dress, or the venue, or deciding on colors or flowers. We wanted to plan our honeymoon first! We booked our extravagant honeymoon a year-and-a-half before our wedding. Heck, we didn’t even have a wedding date! We figured if all else failed, we could just get married on our honeymoon adventure. We knew we wanted to spend our first days together as husband and wife somewhere in the Caribbean. Plus, we have always loved the free spirit of the Jamaican culture. Our tropical dream was all about beautiful white-sand beaches and clear blue water with the sounds of reggae steel drums ringing in our ears. 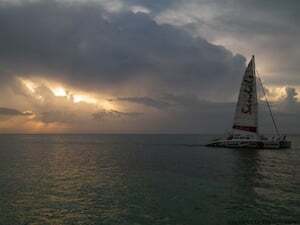 Although we were fearful of traveling to Jamaica during the hurricane season, everything we researched prior to booking our stay had assured us that hurricanes directly hitting the island were very rare. Our only weather concern was the rain. When it did rain during a few days on our trip, it was just a romantic drizzle over the swaying palm trees in the warm temperatures that cooled you off for a moment. When we discovered that Sandals Resorts was having a 65% off sale, we jumped at the opportunity and booked our trip. Since our trip was reserved well in advance, we would have to wait another six months before finding and booking our airfare. We chose a luxury oceanview room complete with a four-poster king-size bed, stocked refrigerator, and walk-out patio where we could enjoy the cool ocean breezes at Sandals Royal Caribbean in Montego Bay. The resort is an all-inclusive paradise that has its own private beach, water sport activities, eight restaurants, numerous pools and spas (including a swim-up pool bar), airport transfers, and most importantly breathtaking views of the Jamaican beach. It is also centrally located to the downtown markets and other tourist attractions, and (regretfully, painfully) close to the airport. Our only disappointment in fact was that we were so close to the airport, it only reminded us of how soon the day would come before we had to get back on that plane to our regular home routine. But then again, the planes only flew over during reasonable hours, and we didn’t spend most of our trip at the resort either. In fact, our main goal was to explore as much of the island as possible. And with that, we succeeded. Sandals Royal Caribbean offers numerous activities during the day and evening. From kayaking to beach volleyball, fashion shows, to making tie-dye t-shirts and enjoying nightly entertainment,the options were limitless. Since we were celebrating Independence Day during our stay, as well as many other guests, the resort offered a Catamaran Cruise excursion (an extra charge) which took us to a beautiful area where we went snorkeling, visited the infamous Jimmy Buffet’s Margaritaville, juiced up on plenty of rum drinks on the boat, and participated in a hot dog eating contest on the way back to the resort. This was one of our favorite activities! Also during our stay, we befriended a taxi driver named Chris and he spent the day with us traveling up to Nine Mile. Here we discovered where Bob Marley grew up as a child and now rests beside his mother in a beautiful mausoleum. The experience was surreal and inspiring as we walked the grounds of this peaceful place. This was also one of our favorite tours as we were able to understand the Jamaican culture and learn more about one of its legendary people. On our way back to the resort we tried some delicious jerk chicken in town that we soon began to crave later. 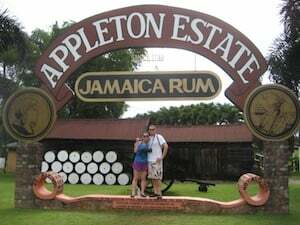 Lastly, our most memorable tour was visiting the Appleton Estate and rum factory where we got to experience the production process and sampling sugar cane and many of their delicious rums. To this day we have yet to find a rum punch recipe that satisfies our taste buds as amazingly as it did that day during our tour. The total cost of our eight-day adventure in Jamaican paradise -- including airfare -- was approximately $4,400. However, we also purchased souvenirs and additional excursions during our trip that were definitely worth the expense. 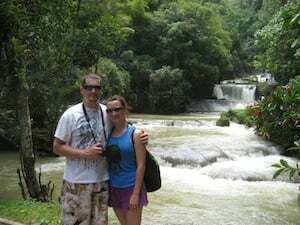 In exchange for the memories we made, and our overall newfound love for Jamaica and its people, the cost of our honeymoon was priceless. 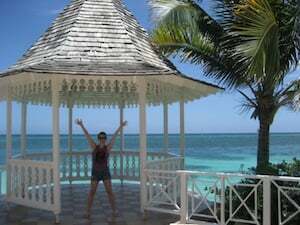 We would definitely recommend other honeymooners to choose Jamaica, and book their stay at a Sandals resort where the staff makes you feel at home everyday. In fact, when you leave the resort, they tell you, “Soon come back home!” and invite you to join their Soon Come Back Program where you can earn points and redeem them on your next Sandals trip. Jeremy and I planned our honeymoon first before the wedding, and we have no regrets. Our wedding ceremony and reception was just as perfectly planned and met our expectations. We married on June 26, 2011, giving us a little time to relax before our big honeymoon. We plan to go back someday, hopefully sooner than later. Until then, we miss you Jamaica!